Environmentalists are calling for French supermajor Total to come clean about drilling “difficulties” that resulted in a North Sea well being sealed off. The energy giant had to restrict access to the Elgin B wellhead platform after running into ‘flow’ issues last month. The alarm was raised as workers drilled 4km below the seabed in the high pressure/high temperature gas field. Only essential personnel were allowed on the platform while other wells in the area were shut down to allow staff to asses the situation. At the time the operator said “some flow” had been detected in the well and that it may have to be plugged and abandoned. A spokesman for Total confirmed that the bottom section of the well has now been cemented off but did not disclose any further details on the exact nature of the issue. Total were fined a record £1.125million for failings that led to one of the biggest ever gas leaks in the North Sea in the same field in March 2012. Leading conservationist and WWF Scotland director Lang Banks said given the past history the firm needs to be held accountable. He said: “It’s good to hear that the repairs to the well have been completed and that there was no escape of gas and no harm to personnel. “However, in the interests of staff and the marine environment, it’s vital the relevant authorities establish exactly what happened and what lessons can be learned for the future. The Health and Safety Executive was informed of the issue with well, which is known as the ‘Elgin Infill E’. A Total spokesman said: “Operations have now been completed and the bottom part of the well has been successfully cemented. “At all times the well was under control at the surface and there was no loss of containment. Total started gas and condensate production from the West Franklin project in January 2015. The Elgin B is a secondary well-head connected by a bridge to the Elgin A. Located approximately 240 km east of Aberdeen, West Franklin was discovered by Total in 2003. 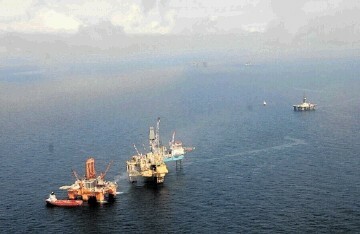 Phase 1 production started in 2007 with two wells drilled from the Franklin platform.